In the modern age scenario, different scale and niche of businesses are adopting high-end technologies to run a business efficiently and effectively. They are making the use of time-saving tools and systems that can help them to improve their productivity, reduce human errors and boost their revenues. With that concept in mind, we bring you the list of 5 best productivity tools that will help you save your time. These tools are free and web-based which means you can bookmark them and use them instantly whenever you are engaged in time-intensive tasks. PDF to Powerpoint converter is an excellent productivity tool that allows you to convert PDF file to PowerPoint, without even retyping the document manually. It not only converts PDFs to .pptx but also helps you convert scanned documents by making the use of state of the Optical Character Recognition (OCR) engine. This engine performs in the back-end and reads the character from an image, and converts them into a digital format and offers you an editable PowerPoint file. You can reuse this PowerPoint file whenever you need it. It is a great tool that saves both the time and money. Trello is a free tool that enables different scale of businesses to organize their work within a few clicks. You only need to sign up and start organizing your business. If you are a beginner, then it would be good to create a board mentioning all your weekly tasks and organize each of them into checklists. You can also make a use of attachments to collect all your important information in one place. When you complete your work, you can go back to the app and mark the tasks as completed or finished. Ge.tt is a pretty fantastic productivity tool that solves the problem of sharing files with your co-workers and friends within a matter of few seconds. The tool lets you share an unlimited number of files with the employees, employers, and clients. It offers 2 GB storage with a free plan. You can use the tool to upload a file. Even, you can send the file via email instantly or copy & paste the shortened download link. It is a simple, clean and sharp tool that automatically converts your bitmap images such as JPEGs, PNGs, and GIFs to crisp and intriguing scalable vector art of SVG, EPS, and PDF with the leading auto-tracking software. This tool saves both time and money. You only need to upload your image and the tool will automatically trace it. This is the most incredible tool that helps you understand your daily habits so that you can concentrate on quality work and be more productive. It functions securely in the background on your desktop and mobile devices. 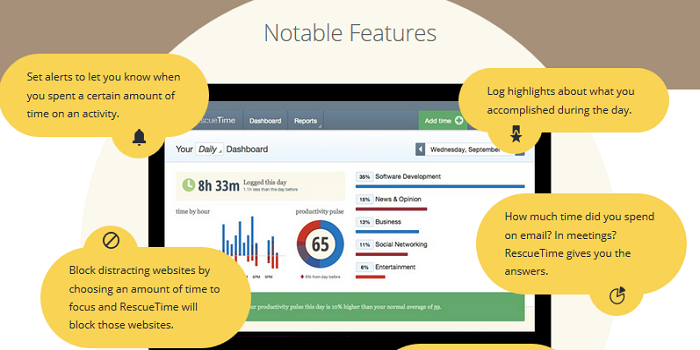 It helps you track time that you spent on your work or tasks. It also gives you in-depth reports and data based on your activity. With the help of these productivity tools, you can automate your business activities and save a lot of your time and effort. Plus, they can speed up time-consuming tasks and bring stability and reliability to your business. Great tools 🙂 For converting PDF files I use ZonePDF. It allows you to convert, split, merge and compress files – super fast and free.